James and Chris are at loggerheads over their Paragon hands-ons. James found it to be a bit too conventionally MOBA-y, despite its obvious roots in the third-person shooter. Chris, on the other hand, declared it marvellously MOBA-y, playing with genre conventions enough to distinguish it while retaining the genre's je ne sais quoi. To each their own, I suppose, but they were in firm agreement on one fact: Paragon looks awesome (in the biblical rather than the late-'90s sense). 'Rush the Core' is a new trailer following up Epic's series of hero showcases with a bit of action. Either that or its the SFX designer's new showreel, because we're at peak particle effect here. Sparrow and Gideon do the rushing, while Grux the space-dinosaur, Dekker and Steel defend. Personally I'd bet on Gideon's inter-dimensional moon missile over Dekker's Fischer Price staff, but I'm a traditionalist. 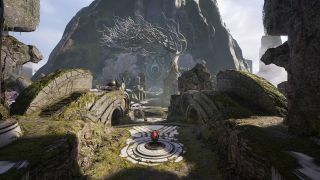 From footage alone, Paragon looks a lot like what I wanted Evolve to be—the verticality is especially promising—but then from footage alone Evolve looked a lot like I wanted Evolve to be.